After returning from a 2 and a half year long hiatus from drawing his Shonen Jump manga series Hunter x Hunter, Yoshihiro Togashi has issues a statement on the hiatus and has responded to complaints from fans about the long break. In his comments section of Weekly Shonen Jump he stated, “I’m sorry for the long wait. I’m a little bit rusty, but I’ll do my best.” Later on he detailed to Mantan Web that he had expected many complaints when he took his hiatus but he hopes the quality of his work will silence any naysayers. The Hunter x Hunter manga returned in last week’s issue of Weekly Shonen Jump magazine. Stay tuned for further developments as they come to light. 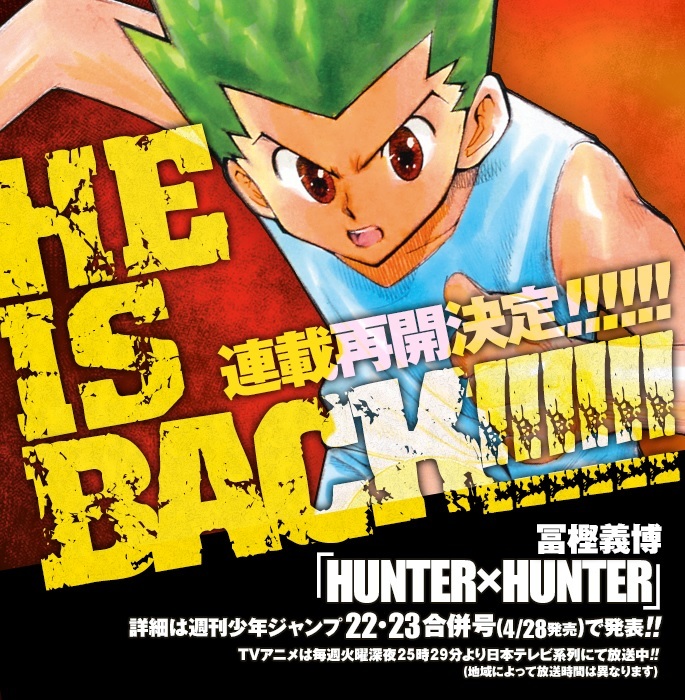 Hunter x Hunter returns to Weekly Jump this August!